Enter to win this Pamper Hamper with beauty goodies worth €50. Open internationally. Happy Mothering Sunday to all you lovely Mommies out there. And to all our amazing mothers as well! I am delighted to announce a month-long giveaway open internationally, with a grand prize of a pamper hamper containing an ElevEase Shower Step, reviewed here, and some great bath and body and skincare goodies, for one lucky winner. Please note that the photograph shown above is for illustrative purposes only and is not indicative of what the winner will receive. The hamper, including the ElevEase Shower Step, is worth €50. Before I tell you how to enter, a word about the ElevEase Shower Step - do read my review here. It is a game-changer that made shaving, scrubbing, cleansing and drying my legs, and clipping and polishing the toenails much easier. I have no idea how I lived before I got this! I'm sure the winner will appreciate it as much as I do. 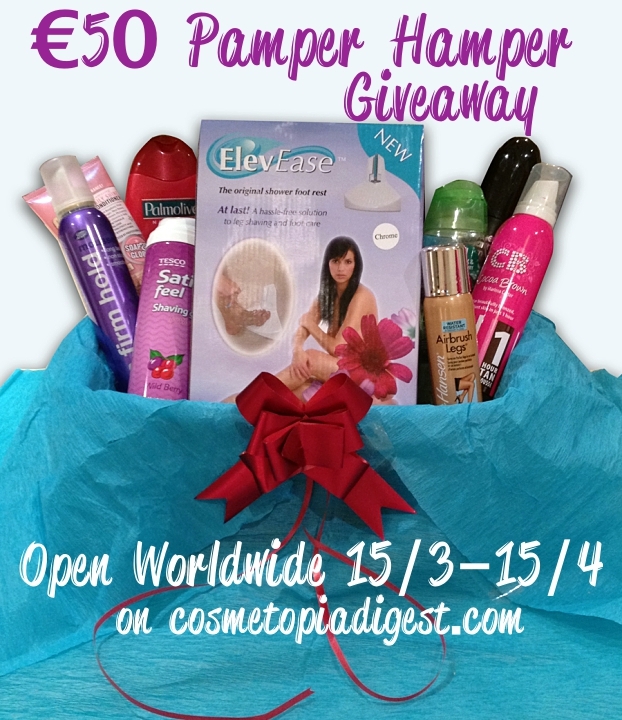 Enter the giveaway for a chance to win a pamper hamper from ElevEase, with skincare/bath and body products worth €50. This giveaway is open internationally from 15 March 2015 to 15 April 2015. The prize is sponsored by ElevEase. One winner will receive the prize, which includes an ElevEase Shower Step and a set of beauty/skincare/bath and body products, all of which are worth a total of €50. The photographs are only for ILLUSTRATIVE PURPOSES. The final CONTENTS OF THE PRIZE HAMPER WILL DIFFER. The winner can choose from a white Shower Step and a Chrome one, based on their bathroom decor. The above photograph is the white Shower Step in my bathroom. You can read more about the ElevEase Shower Step here and maybe order one as a gift for someone from here or from Amazon. Neither ElevEase nor I will be responsible for customs duties, local taxes, import charges, excise or any surcharges incurred by the winner. I will not be responsible for packages delayed, lost or damaged in the post. The winner must email me their shower step choice, shipping addresses and telephone number within 24 hours of being contacted. Disclosure: The prize of this giveaway is sponsored by ElevEase. I have received no compensation in cash or kind for hosting the giveaway.